There have been many great genius prodigies in the classical music world, most as young violin and piano masters. Three of my favorites that come to mind are Wolfgang Amadeus Mozart, Felix Mendelssohn and Franz Schubert. Their remarkable God blessed talent wasn't just in their remarkable virtuosic playing of the piano and violin as young children, but also of their accomplished mature compositions as teenagers. Wolfgang Amadeus Mozart was born in Salzburg, Austria on Jan. 27, 1756 and died in Vienna on Dec. 5, 1791. His genius on the piano was discovered early at age 4. "At age 5, Mozart wrote his first published composition, a miniature andante and allegro for piano. Mozart wrote music for a number of occasions. In 1770, Mozart (only 14) was commissioned to write an opera (Mitridate, re di Ponto)...the opera was a huge success and was performed 22 more times." Mozart composed 5 piano concerti by age 17. He composed his first Symphony at the incredible young age of 8. In fact, Mozart composed the majority of his 41 symphonies before he turned 20 years old. 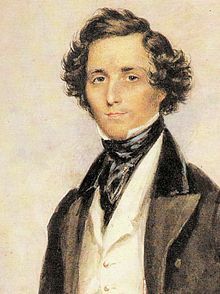 Felix Mendelssohn was born Feb. 3, 1809 in Hamburg, Germany and died November 4, 1847 in Liepzig, Germany. This child prodigy began his piano lessons from his mother at age 6. Besides being a virtuoso pianist at an early age, Mendelssohn was also a prolific composer at a young age. "Between the ages of 12 and 14, Mendelssohn wrote 12 string symphonies" ... "He wrote his first published work, a piano quartet, by the time he was 13." ... " In 1824, the 15-year-old wrote his first symphony for full orchestra (in C minor, Op. 11)." At age 16, Mendelssohn wrote what many consider one of the greatest chamber music pieces ever, his Octet for Strings in E-Flat Major. This remarkable piece, composed by a teenager is one of my favorite pieces in the chamber music genre. The first movement of this piece has a mesmerizing theme that grabs a hold of you from the start; and from the 13:00 minute mark of the video below to the 13:52 mark is one of the most satisfying conclusions of any chamber music piece movement, in my opinion. Just a year after writing that amazing piece, Mendelssohn wrote the beautiful and exquisite Overture to A Midsummer Night's Dream at the age of 17. Franz Schubert was born Jan. 31, 1797 in Austria and died in Vienna on Nov. 19, 1828. Young Schubert first came to the attention of Antonio Salieri, then Vienna's leading musical authority. Schubert's genius began to show in his compositions at a young age. Franz Schubert was a prolific composer. By 1814, at the age of 17, the young composer had written a number of piano pieces, and had produced string quartets, a symphony, and a three-act opera. Before Schubert turned 20 years old, he had composed an incredible five mature symphonies. Note: The video below of Mozart's piano concerto #6, that Mozart composed just before he turned 20, has a special meaning to me as my daughter, Ebony, played the first movement for piano competition at age 13. And she played it perfectly! So, she was playing this piece as a young teenager that was composed by a genius teenager. Please turn up the volume and listen to some great music from these classical music geniuses that they composed as teenagers. As usual, your provided music is filling my house with beauty. I have to say, though, that nothing (well almost nothing) beats Mozart. Thank you so much for your music blog. This is one of the most astonishing venues that I've attended for my numerous experiences. This party venue is spot on with the decorations. The overall experience was amazing! Had a fun and comfortable time here.